ANET is a leading provider of web conferencing, private and public sectors. With our experienced team of experts, we aim to provide high quality, reliable, efficient and secured Internet access supported by exceptional after-sales services. Organizes a web meeting with full audio-visual and file sharing capability, any time and anywhere over the Internet. These programs allow participants to join conversations and collaborate on projects. The system can support up to 100 participants and operable on various devices i.e. PCs, Laptops and mobile devices. 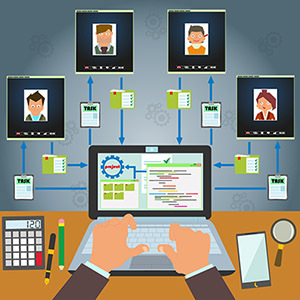 Web conferencing functions as a great tool for intercompany interactions. One tool, application sharing, is great for letting attendees collaborate on an important project.